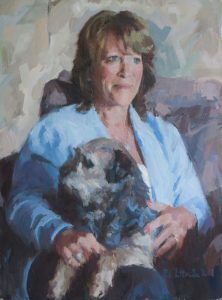 When Roddy came to pick up the portrait of his wife, Sian, there was a general consensus that really it was only right and fitting that he should have a portrait painted of himself. But rather than have a matching “his ‘n hers”, he felt that his portrait should be completely different. Where her portrait was a half-length, Roddy felt a head and shoulders was more appropriate. Sian (together with the ever heavenly Dolly) was firmly despatched to the house while Roddy strode into the studio. He had quite firm ideas on what he did and didn’t want. And most certainly didn’t want too much input from his wife! Absolutely vital, and top of the list was that he wanted his glasses to be perched atop his head as that is where they live. Trying to sum up Roddy is rather daunting as his character dwarfs his six-foot-four frame and his easy confidence immediately fills the room. Large ‘laughing eyes’ betray a wonderfully irreverent and often politically incorrect sense of humour as well as a rather unexpected kindness and sensitivity. An ex-military man (15 years in the Royal Hussars and a further 17 in the MoD), Roddy is now a military historian with 3 published books to his name and another, on Cornwall’s involvement in the D Day landings, soon to be published. This was a portrait that needed to be zinging with energy. And, if it was going to be different from his wife’s, Roddy felt that it might as well be as different as possible. 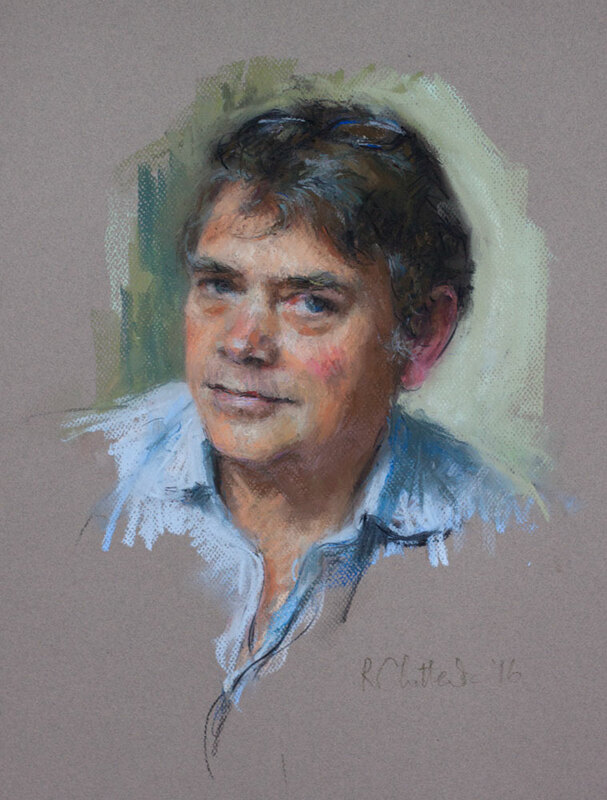 As a drawing tool, pastels are a wonderful way to transmit energy through the use of line. They are also a good medium for conveying informality, which suited the brief. And a head and shoulders keeps the focus on his huge laughing eyes, framed by wonderfully wild and unruly eyebrows, and of course, increases the importance of the glasses on his head.